Group revenue increased by $22.1 million or 93.1% from $23.8 million in 2QFY2018 to $45.9 million in 2QFY2019 and increased by $24.2 million or 49.7% from $48.9 million in 6MFY2018 to $73.1 million in 6MFY2019. In 2Q2019, the revenue contributed by all business segment have increased significantly. In 6MFY2019, the revenue contributed by A&A, C&P and Others business segments increased significantly and it was offset by decreased from R&R business segment. The Group's gross profit increased by $0.3 million or 5.7% from $5.0 million in 2QFY2018 to $5.3 million in 2QFY2019 and increased by $0.7 million or 7.7% from $9.4 million in 6MFY2018 to $10.1 million in 6MFY2019. The decrease was mainly due to lower margin contributed by the completed projects from more competitive pricing during the period. The Group's other income decreased by $0.3 million or 55.8% from $0.5 million in 2QFY2018 to $0.2 million in 2QFY2019 and decreased by $0.6 million or 58.9% from $1 million in 6MFY2018 to $0.4 million in 6MFY2019. The decrease was mainly due to reduced government grants applicable to the Group. 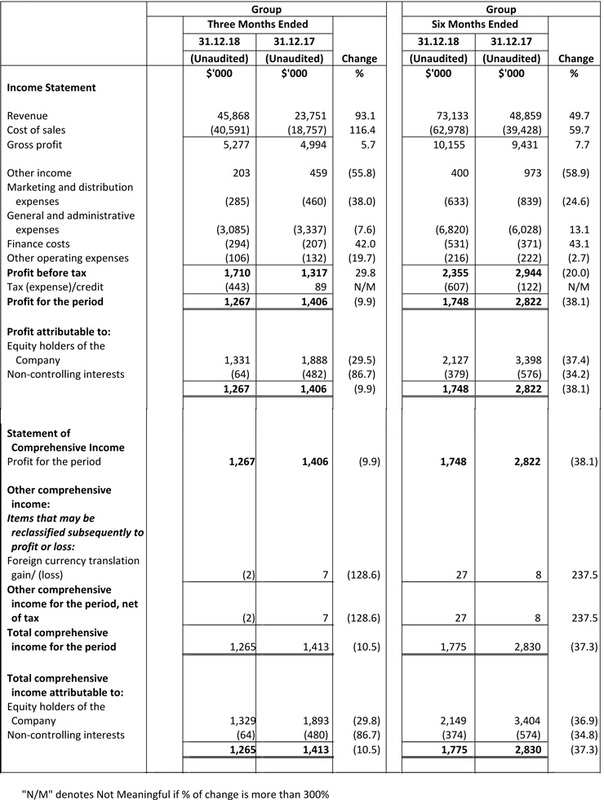 The Group's marketing and distribution expenses decreased by $0.2 million or 38.0% from $0.5 million in 2QFY2018 to $0.3 million in 2QFY2019 and decreased by $0.2 million or 24.6% from $0.8 million in 6MFY2018 to $0.6 million in 6MFY2019. The decrease was mainly due to decrease in motor vehicles related expenses. The Group's general and administrative expenses decreased by $0.3 million or 7.6% from $3.3 million in 2QFY2018 to $3.0 million in 2QFY2019. The decrease was mainly due to decrease in overhead cost reduction such as rental and certain administrative cost. The Group's general and administrative expenses increase by $0.8 million or 13.1% from $6.0 million in 6MF2018 to $6.8 million in 6MF2019. The increase was mainly attributable to the increase in depreciation of property and renovation of office building. The Group's finance costs increased by $0.1 million or 42.0% from $0.2 million in 2QFY2018 to $0.3 million in 2QFY2019 and increased by $0.1 million or 43.1% from $0.4 million in 6MFY2018 to $0.5 million in 6MFY2019. The increase was mainly attributable to the increase in borrowing to finance the purchase of office building and working capital need for certain sizable projects. As a result of the above, the Group recorded a profit before tax of $1.7 million in 2QFY2019 and $2.4 million in 6MFY2019 as compared to a profit before tax of $1.3 million in 2QFY2018 and $2.9 million in 6MFY2018. The Group's tax expenses increased by $0.5 million or 597.8% from $0.1 million tax credit in 2QFY2018 to $0.4 million tax expenses in 2QFY2019 and increased by $0.5 million or 397.5% from $0.1 million in 6MFY2018 to $0.6 million in 6MFY2019. The increase was mainly due to lower tax incentives. The Group's non-current assets decreased by $2.7 million or 5.9% from $45.8 million as at 30 June 2018 to $43.1 million as at 31 December 2018, mainly due to the depreciation of property, plant and equipment ("PPE") and amortisation of intangible assets, which was partially offset by the acquisition of PPE. The increase in current assets of $32.8 million or 51.2% from $64.0 million as at 30 June 2018 to $96.8 million as at 31 December 2018 was mainly due to the increase in contract assets, asset held for sale, inventories, trade and other receivables, and cash and bank balances. The significant increase in trade and other receivables of approximately $22.5 million mainly arose from the billings to a major customer of $18.8 million of which $15.6 million was subsequently collected as of the date of this announcement. The decrease in non-current liabilities of $1.0 million or 6.7% from $15.7 million as at 30 June 2018 to $14.7 million as at 31 December 2018 was mainly due to repayment of bank borrowings. The increase in current liabilities of $29.9 million or 91.9% from $32.6 million as at 30 June 2018 to $62.5 million as at 31 December 2018 was mainly due to the increase in trade and other payables, finance lease liabilities, tax payables and drawdown of bank borrowings. The increase in trade and other payables was mainly due to better working capital management. Net cash generated from operating activities amounted to $2.2 million in 2QFY2019 which was mainly due to the increase in operating cash flow before changes in working capital and trade and other payables which were partially offset by increased in contract assets/liabilities and trade and other receivables. 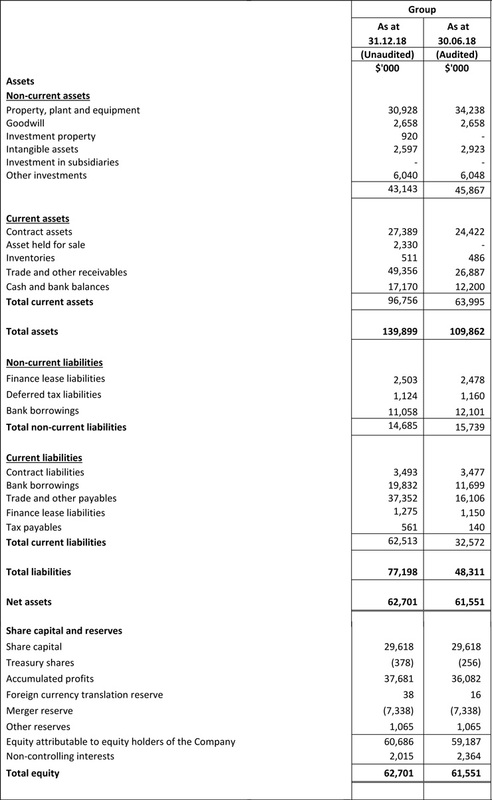 Net cash used in operating activities amounted to $0.4 million which was mainly due to the increase in contract assets/liabilities, trade and other receivable and inventories, which were partially offset by the increase in operating cash flow before changes in working capital and trade and other payables. Net cash used in investing activities amounted to $0.2 million in 2QFY2019 and $0.9 million in 6MFY2019 was mainly due to the purchase of PPE, which was partially offset by the proceeds from disposal of PPE. Net cash generated from financing activities of $4.3 million in 2QFY2019 and $6.2 million in 6MFY2019 was mainly due to the drawdown of bank borrowings to finance the purchase of corporate office and working capital financing, which were partially offset by fixed deposits pledged to banks and repayment of bank borrowings and finance lease. The Group's order book as at 31 January 2019 remained strong at $132.8 million, and which is expected to be delivered over the next two years. The Group has been awarded second Home Improvement Programme ("HIP") project worth $26.3 million after the award of its first HIP project in year 2017. The number of old flats in Singapore is increasing and the government spending on HIP programme is expected to be increased. The Group is expecting to gain more business opportunities from this programme due to its track record. Besides that, Singapore plans to have largest offshore floating solar panel system which is the world's largest sea based floating photovoltaic ("PV") system which is currently built on freshwater ponds, lakes or reservoirs. The system is developed by one of Singapore leading sustainable energy provider Sunseap Group. The Group has also been awarded for floating solar installation project worth $11.3 million by Sunseap Leasing Pte Ltd who is also the Group’s strategic partner. The success of this project is expected to open up similar opportunities locally as well as around the region. The Group has seen an improvement in the R&R sector with the Group having won a few sizeable projects worth in aggregate $9.8 million recently. Even though market likely remain challenging, the Group will continue to leverage on its strength to secure more projects for its sustainable growth in the long term.